Antitrust has been part of Analysis Group’s core focus since it was established in 1981. The team has worked recently on key competition cases at the heart of the healthcare, media, communications, transportation, computer and payment card industries. It boasts one of the largest practices in our survey, and has been on a notable growth spurt – adding 48 antitrust economists since the last Economics 20 survey. The group of 253 competition specialists bolstered its practice with the appointment of Claudio Calcagno as a vice president in the economic consultancy’s London office and the hiring of Antoine Chapsal as a principal in Paris in 2018. Chapsal, Pierre Cremieux, Emmanuel Frot and Analysis Group president and chief executive Martha Samuelson are Who’s Who Legal: Competition nominees, while Rebecca Kirk Fair, Mark Lewis and Dov Rothman are recognised as future leaders in their field. The group advised media company Scripps in its acquisition by television company Discovery. The deal combined Discovery’s portfolio – which includes brands such as Discovery Channel, TLC and Animal Planet – with Scripps’ HGTV, Food Network and Cooking Channel. The deal saw Discovery own five of the top female networks in ad-supported pay-TV, accounting for more than a 20% share of women watching primetime in the US. The team supported Scripps’s lawyers in evaluating the potential competitive concerns with multichannel video programming distributors for bundled programming. The deal was subsequently approved in 2018. Analysis Group was involved in 121 antitrust litigations in the past year – the largest number of the economic consultancies that reported the statistic. The Federal Trade Commission (FTC) retained the team for the agency’s review of Sanford Health’s proposed acquisition of Mid Dakota Clinic. Sanford Health is the largest rural, non-profit healthcare system in the US, and the Mid Dakota Clinic is one of the largest employers in the region. In 2017, a trial judge granted a preliminary injunction halting the proposed merger; the two hospital networks have appealed. In one of the highest-profile antitrust cases of the year, Analysis Group assisted the economic expert testifying on behalf of former traders being criminally prosecuted by the US Department of Justice for allegedly manipulating foreign exchange benchmarks. As this publication went to press, all three defendants were found not guilty by a jury in New York federal court. Analysis Group also advised Microsoft in a Canadian class action that accused the company of exclusionary and anticompetitive conduct regarding its operating system and applications. The case was settled. 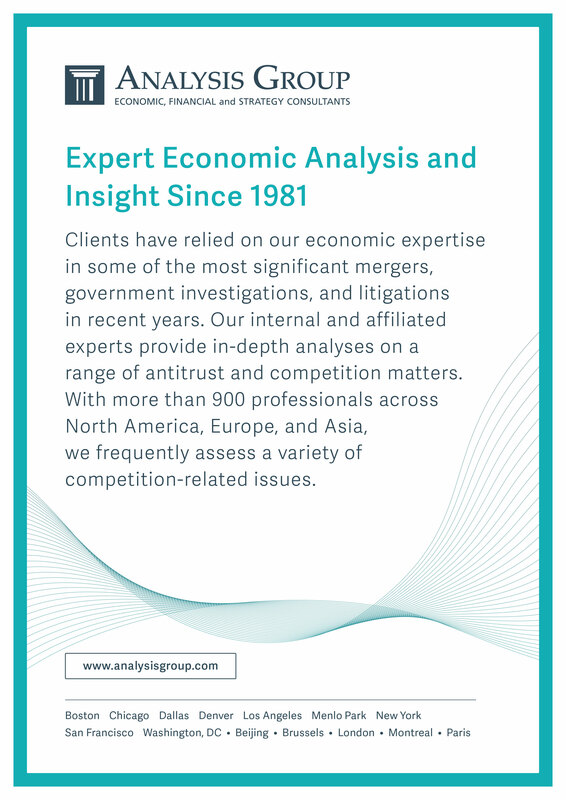 Antitrust has been a core focus of Analysis Group’s work since our inception in 1981. We integrate industrial organization theory, industry-specific expertise, and the latest quantitative analytical methods to understand the conduct and market dynamics at issue in antitrust litigation and merger investigations. We have demonstrated our expertise in complex assignments related to class certification, antitrust liability, antitrust damages, and the competitive effects of proposed mergers and acquisitions. Our antitrust work covers a range of industries and markets, including high tech, financial products, manufacturing products, insurance, health care and pharmaceuticals, agriculture, and many others. Over the last decade, we have provided support to internal and external experts in some of the most significant mergers and government competition investigations, including various recent cable TV mergers and challenges to the Anthem-Cigna merger and St. Luke's acquisition of Saltzer Medical Group. We have also been involved in numerous high-profile monopolization cases involving such companies as Microsoft and Intel, as well as some of the largest cartel cases in industries including credit cards, vitamins, TFT-LCD panels, cathode ray tubes, and auto parts. Another area of focus for our recent antitrust work has been in the pharmaceutical industry, where we have been involved in a number of high-profile reverse-payment, product-hopping, and delayed generic entry matters. In addition to our antitrust and competition work, we provide expertise in economics, finance, health care analytics, and strategy to top law firms, Fortune 500 companies, and government agencies. Our internal experts, together with our network of affiliated experts from academia, industry, and government, offer our clients exceptional depth of expertise.